Combi Packs: Epo-Boost, VO2-Boost, Invigor8 and More! For many users, CalmLegs® brings rapid relief from Restless Legs (RLS), starting with more peaceful sleep. Deep, restful slumber boosts daytime energy levels and sharpens mental alertness. A bright, positive mood follows. Productivity at work improves. The notorious strain Restless Legs (RLS) places on personal relationships melt away into peaceful harmony. Most importantly, as Calm Legs® helps with Restless Legs (RLS), it restores your quality of life. Imagine going to the movies, a ballgame or your favorite fine restaurant and simply enjoying yourself without the dread of twitching legs. Picture yourself traveling comfortably without the fear of uncontrollable kicking. Envision curling up with a good book in your favorite recliner, and later luxuriating in bed before blissfully drifting away to dreamland. 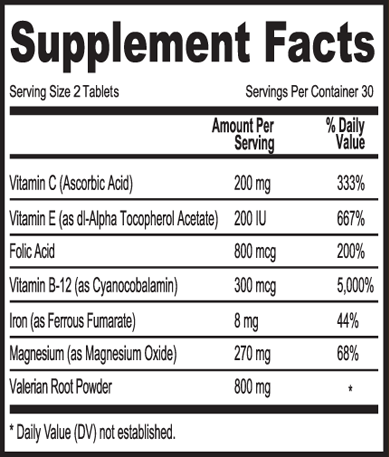 Take two (2) tablets daily between your evening meal and bedtime. Take consistently for maximum effect. Improved sleep quality and relief from symptoms of Restless Legs (RLS) should occur within a few weeks of initiating use of this product.